Live from E3 ’09: The Return of the Glitz or the Future of Gaming? 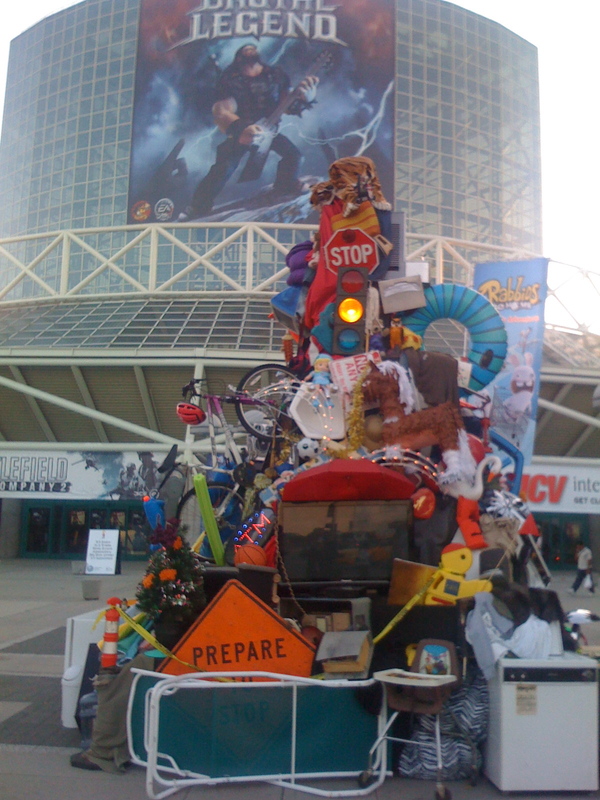 Electronic Entertainment Expo (E3) is the bastion of the video games business. If GDC is for developers, E3 is for the suites and the media, the best timing to launch a new game, console, or business in the interactive entertainment world. This event typically epitomizes the progressive blending of movies and games and this year also marks the return of the glitz. What about the future of the gaming industry? Can you find it here? Here are the top 4 news that caught my attention. Probably the most far reaching announcement of the pre show press conference was a new addition to the Xbox that will “change the way we interact with computers” (Bill Gates). A depth sensing camera and chip that recognizes natural human gestures, developed by 3DV Systems and acquired by Microsoft. More on the announcement at Seeking Alpha. 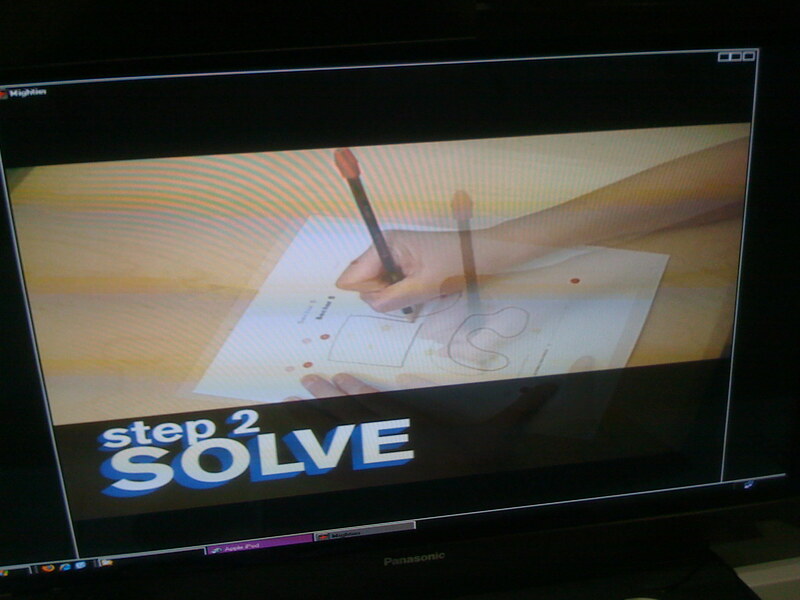 Although this is just a concept video, it seems that technically Microsoft has leapfrogged Sony’s eye toy. But Sony has already been dabbling with camera based applications for several years now. Expect a good fight between the two. Competition is good. My biggest disapointement was the Peregrine Glove. It promised to be a “Wearable technology like no other”. 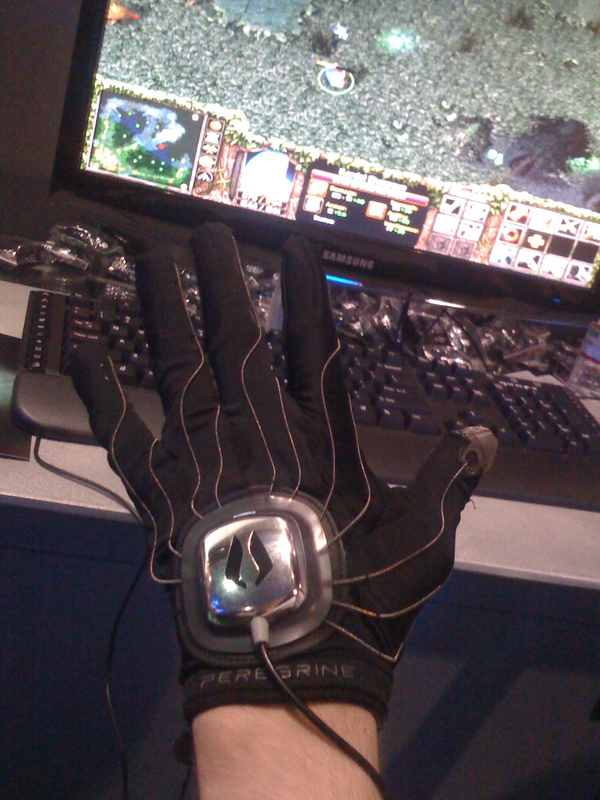 It looks very cool, but it turns out to be just a touch sensitive glove. Using your thumb touch different parts of your fingers to feed the computer with various commands…on a good day it could replace the keyboard when playing a real-time strategy game. 3) RealityPro by Digital Extreme Technologies Inc.
Meet Bob Ladrach (with my kind of hair style) VP product development at Digital Extreme, an Augmented Reality enthusiast since 1992, showcasing a concept AR sword game. 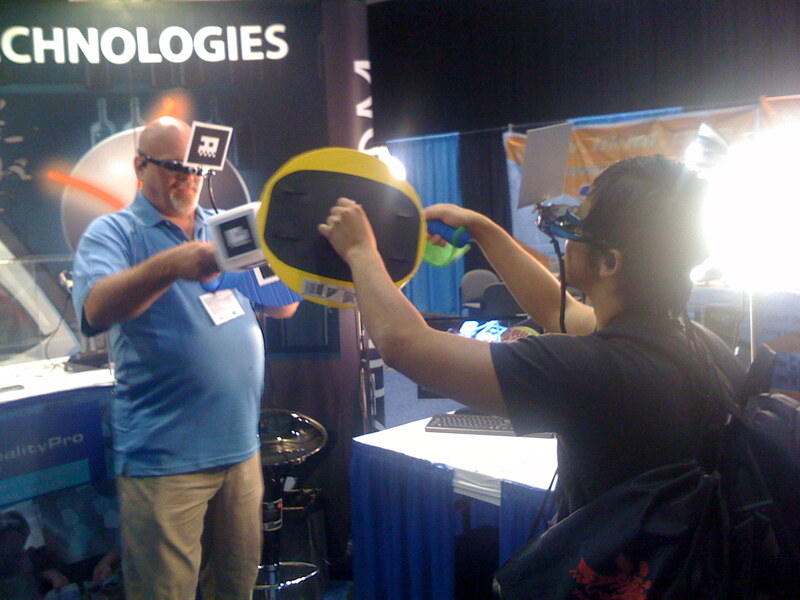 The demo was using Vuzix VR with mini cams and Artoolkit markers glued to it. Bob gets AR: he preaches that it should be low cost, user friendly, and that it should look cool. AR technology is maturing; all it needs is someone to create an experience that people would want to pay for. DXT think they can pull it off. 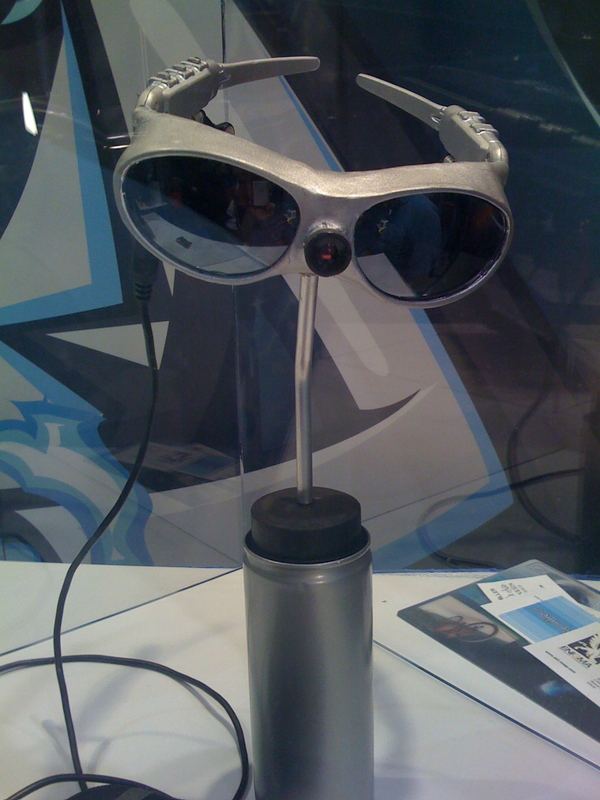 They’re working on RealityPro a mobile AR hardware platform: goggles + portable mini computer + input devices for interaction with objects and characters in the 3d world. DXT is essentially a hardware company and will encourage developers to build games and apps loaded on “easy to use mini cartridges”. Ultimately the content is what will make or break this device. Games alfresco: How’s it different than A_rage‘s attempt? Bob: 4 years of hardware advancement. Games alfresco: when will it be ready? Bob: in about a year. Games alfresco: how much will it cost? Bob: I can’t really tell. The first, probably $2500. Down the road it will be reduced to $400-500 a piece. A bit sketchy, but good luck Bob! A nice surprise awaited me at the IndieCade booth, an organization dedicated to showcasing the future of independent games. 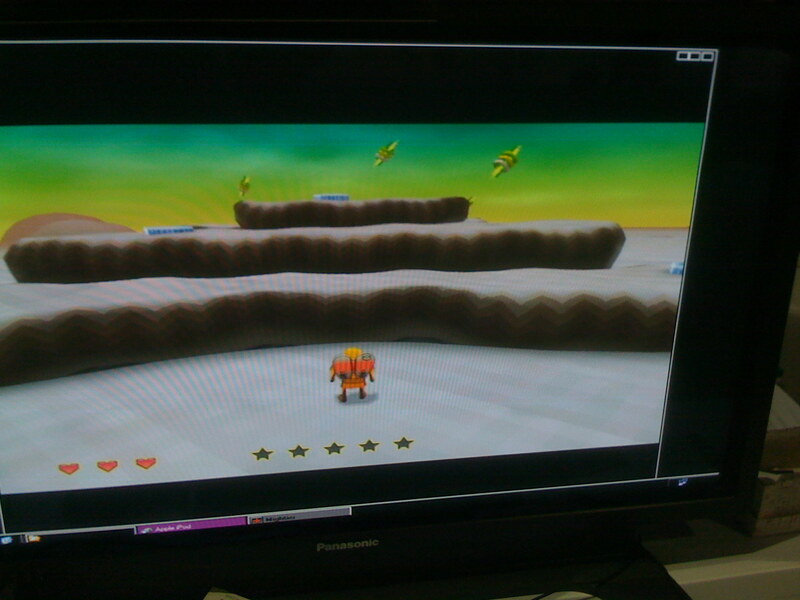 Yes, you’re still glued to the screen, but it’s a nice step towards blending the real and the virtual. 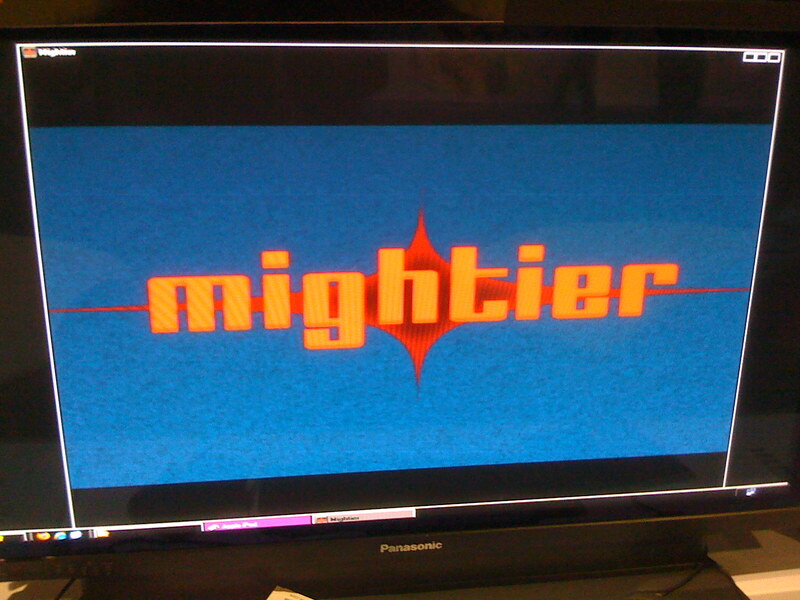 Wish Mightier luck in winning the 2009 IndieCade festival. So, are any of these game changing? You be the judge.